I am a very conservative Democrat. The Democratic Party unfortunately has been hijacked by a group of super elite leaders in Washington, whose actions show they care little about regular people. For America to survive in the future; government, at all levels, must live within its means and we must balance our budgets. I offered my commentaries on this subject in an essay that I titled: What happened to the Democratic Party? The Times Leader, our fine local paper opted to change the title to “Reader laments Democrat changes.” Feel free to view their adaptation at http://www.timesleader.com/opinion/122792264.html. The Times Leader lumps all of their letters to the Editor in one big online article so you will have to scan to find mine. I knew that with my great campaign manager and lifelong friend Marty Devaney running a Congressional campaign, in which I was able to gain 17% of the vote as a virtual and real unknown, he and I had at least one more campaign in us. After we helped Mr. Barletta get elected, I began to contemplate running for the US Senate. Life is an ongoing venture and even when you think your life is mostly settled it may not be. After the elections, I was approaching 63-years old and I was continuing to achieve my best student evaluations at Marywood University. My plan was to stay as Assistant Professor at Marywood for another five to ten years. The best laid schemes of mice and men gang oft aglay! It was not to be. Believe me; I have thought over and over again that perhaps I should not tell everybody that I was fired by Marywood University as it may hurt me in attempting to appear as a person worthy of the vote of my peers in Pennsylvania. However, I am not embarrassed about being fired. Moreover, I do not wear it as a badge of honor. However, if I were to choose between the two, I would say I like the notion of the latter more than the former. At 63 years of age, an old fart for sure, I do admit that it did hurt me financially and bit in the heart. Though Obama stickers were spread throughout the campus at Marywood before I even had began my quest for Congress, I was not permitted to hang a one. In fact, I was specifically told that I could not hang a poster, or talk to a person on campus about my candidacy. I was told specifically not to ask any of my fellow professors to sign my nominating petition while on Marywood property. I thought this was strange as there had been so much admiration and pumping up for Obama just a while before. Furthermore, I was told not to mention Marywood in any of my campaign literature. Until I chose to run for Congress the Provost and I had never met. When I decided t run, we became phone mates. One could have concluded that my opponents, either the O’Brien family from Scranton or the Kanjorski family from Nanticoke had made a call at the top. All of a sudden, important people at the University actually knew my name. When I was asked by the press where I worked, I admit, I did reveal the secret. It was Marywood University. Sorry! It was either that or it would appear that I was unemployed. Why would any of this cause me to be fired when my record was clean? I do not know. Maybe it had nothing to do with the secret but that I was getting too old to teach even though a super majority of my students seemed to like what I had to say. Sometime one never knows why! In what appeared to be no more than a week after the general election, and after sharing with some peers at Marywood my plans for running for the US Senate against Robert P. Casey, I was informed by my Department Chairman that my Assistant Professor contract would not be renewed in 2012. I recently learned that the Chair has now “moved on” but nobody at the University is freely talking about it. Maybe my “conservative political” poison spread to others around me. My two best friends at Marywood—two of the most dedicated professors in the Business Department were also fired. Both of these professors had attended my campaign events and were seen on TV as part of my extended campaign. Even so, it never even crossed my mind at the time that I could have been fired because I exercised my constitutional right to run for public office. 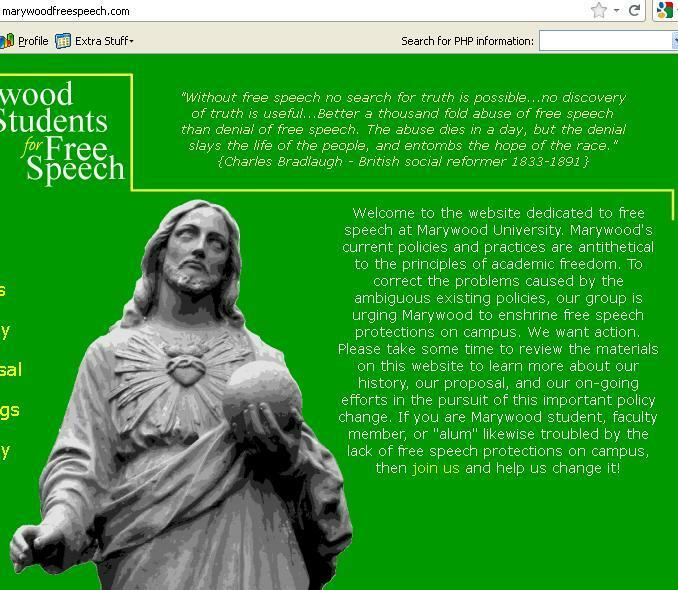 Marywood is a Catholic institution. The Chairman told me that I had lost my job at Marywood University because of a departmental restructuring in which everybody in my category would be replaced by outsiders who would not be in my category. Yet, when I spoke with the other people, I learned that only two of the three of us in the same category were fired. The other professor fired was one of my best friends on campus. A third professor in the same category informed me that he was unaware of the restructuring. I smile every now and then and I think maybe I was just getting too old and they chose to let me go because of that. But, maybe not! Everybody has an opinion. I met some Scranton politicos at a wedding in which a few mutual friends chose to tie the knot. Now, these guys are well oiled in the political game. They told me to forget about the restructuring and forget about being too old for Marywood. Their unanimous conclusion, rendered quickly I might add, was that I was fired for political reasons. I stepped on somebody’s toes at Marywood or worse yet, I stepped on the toes of a Marywood donor. The fact that only two of three, met the restructuring criteria meant from their perspective that restructuring was simply a convenient excuse. I had grown accustomed to believing Catholics at their word, and so in my mind, this is all still a jumbled mess. I was assured by my boss, who had been a Business Department Chairman for a very long time that the decision came from the top. He told me that he could do nothing to reverse it. For years, while I was with the IBM Corporation as a Senior Systems Engineer, this same man had asked me to join the Marywood faculty. Eight years ago, I took him up on his offer. Several years later the institution promoted me to Assistant Professor so I was doing something right. Life for me at the time appeared rosy. I had done nothing to warrant being fired so I was inclined at first to believe the idea of restructuring. The Chairman tried to make it all better as he knew it was bad news for me. He said that these things happen but the decision was made solely by the administration. He assured me that my position was not eliminated for cause. He insisted that my evaluations were always excellent. He then wrote an excellent letter of recommendation for me, in which he praised my work. He had convinced me that I was simply a victim of circumstance. Since I had done nothing wrong to warrant termination; he volunteered that Marywood would not object to my collecting unemployment compensation after the second semester ended in 2011. Yet, when I signed up for unemployment, the Provost, who is the first officer at Marywood under the President, contested my filing and denied my application for unemployment compensation. When this happened, my faith in Marywood was shaken. When we were in the waiting room for the UC hearing in Scranton, I introduced myself to the Provost, who knew enough about me to represent the University but did not know enough about me to know what I looked like. When I told him who I was he looked at me as if he was not sure. We had never met. I had met and had phone conversations with his predecessor but I had never met the Provost who came to the hearing. I was represented by an attorney. He could not understand why Marywood would not send their attorney or an HR representative to the hearing. Sending a very important official to an unemployment hearing would not be protocol in most businesses. This intrigued me. I wondered why I was so important to Marywood that a major university official would take the time to prepare and then attend a hearing simply to block my request for unemployment. What was it that I had done? Marywood contested my opportunity to receive unemployment, and so far, we have had two appeals and we are now moving to Commonwealth Court. It is now late February, 2012, ten months or so after my last day of work. I have yet to receive a dime of unemployment compensation. It sure seems that there is a very powerful person associated with Marywood who does not like me. I still walk through the possibilities but I do not expect Marywood to give met their real reasons ever. Was it age discrimination? Was it because a powerful donor to Marywood, with major political connections had called in a favor? Why would a Catholic institution lie about its intentions regarding unemployment compensation to a Catholic Employee? Is it possible that Marywood is simply not as Catholic as many Catholics might think? Could it have been something else? On any day of any week, I admit that I would prefer Lou Barletta over the 2010 D11 incumbent, and if it really did cost me my job to run for office, which only God knows, then so be it. Would Paul Kanjorski or Corey O’Brien have called in a favor at Marywood? I will never know. I do know that it was not that I was just too old to teach anymore. Making intimations that I might run for the Senate seat against Scranton’s favorite son, Robert P. Casey Jr., in a Scranton Catholic College probably did not help my job retention probabilities. I do not recall Marywood officials standing up for Bishop Martino as he lost his job as the head of the Scranton Diocese after attacking Bob Casey Jr., and intimating that receiving the Sacraments might not be in his future. In this mystery, it is interesting to note that Mrs. Robert Casey Sr, is a Marywood graduate and a former member of the Marywood Board of Directors. I have no friends on the Board so I would not know if a trivial notion such as firing a faculty member would have ever trickled up that far. Prior to Bishop Martino’s sudden disappearance, It was a point of discussion in the diocese that after he began to attack Bob Casey Jr.’s strong proclivity for our pro-abortion president, Barack Obama, and Casey’s not-so-strong pro-life record, the Catholic Church did not appear to be on the Bishop’s side. Instead, Bishop Martino found himself looking for a new job. So, on the brighter side, maybe I am in good company.